We provide tug boats with shallow draft which makes them ideal for assisting dredgers, civil engineering works going on at coastal regions. These shallow water tugboats due to its low drafts are also ideal for towing barges at river channels and at coastal regions. 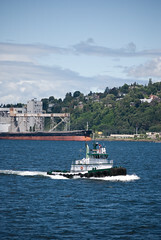 The barges are capable of towing hopper barges, dump barges, pontoons etc. These tug boats can be utilized for job works in harbor or at coastal regions and also for mooring work. These tugs are best suitable for all purpose shallow water operations. The tug boats are loaded with all required equipments which are needed for the towing and assisting operations. For more details and quotations, kindly do contact us.